Putting toys and games into the hands of kids in hospitals! Since 2003, they have raised many millions of dollars to improve the quality of life of kids in hospitals. WHO IS WAFFLES FOR HOPE? Waffles For Hope was founded by Me, Waffles! I got the nickname in a fit of silliness, and serving waffles has been a thing of mine ever since. I also like to hold parties at Anime Detour, my favorite convention, held every spring here in Minneapolis. My first party in 2010 was a rave dance room with lights and live DJs, but I wanted to tone it back and start supporting Child's Play. In 2011 the plan was to have video games for people to play, support Child's Play and serve waffles on the side - but as soon as the doors opened, the waffles took over! The first year we served 400 waffles and raised $220 over two days. 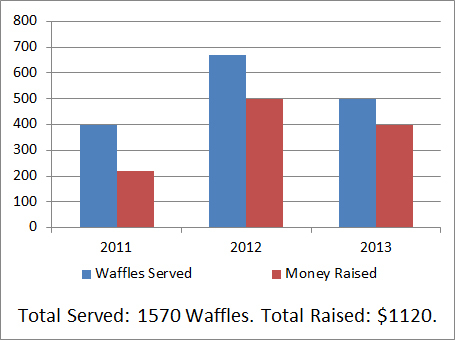 In 2012. we served 670 waffles and the generosity ballooned to a whopping $500. Finally in 2013 we served 500 waffles and raised $400! This time we want to spread joy to even more kids going through hard times. Child's Play was first started by the Penny Arcade creators and quickly grew from there. Their aim is to put toys and games into the hands of kids in hospitals. We love that! We could talk ourselves blue in the face about how wonderful they are but we believe that these videos will do it better. The videos below can be found on Penny Arcade's website in the Penny Arcade TV section. If you don't mind some serious tearjerkers, you could also read the testimonials from their official site.